Are You Tired of My Fall Pictures? Sigh, as I struggle under a mound of satin and bejeweled organza (pictures by the weekend) on this rainy and dreary day, my kids and I lament the ending of this beautiful fall we’ve had. The brilliant sun, the long shadows, the days outside on the swing…all coming to a close. 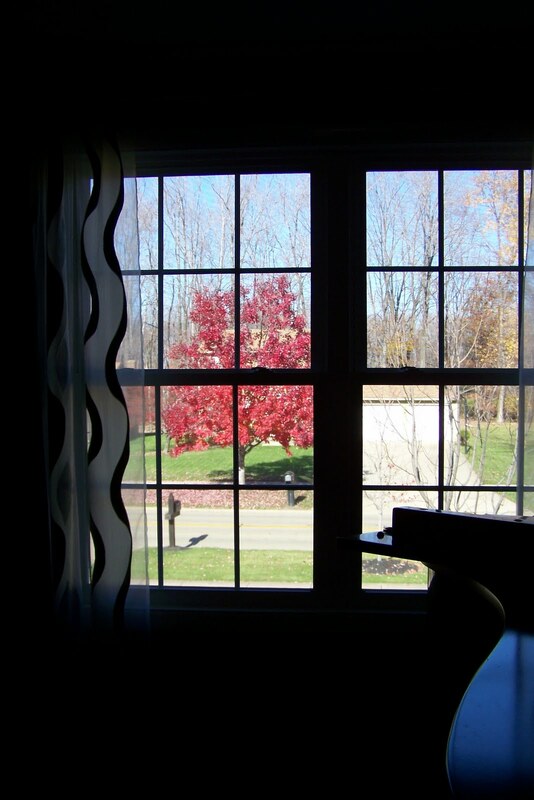 I love looking out my front window at the lone tree whose fiery leaves will remain long after the first snow flies. 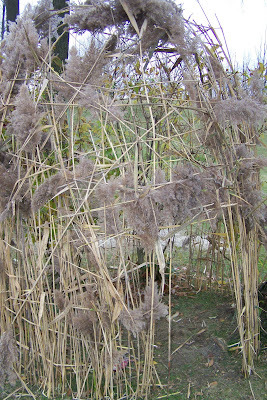 And here is a hut my kids are building out of the tall grasses that are like bamboo in the back. Will they finish before the weight of the snow crushes it? I love Fall pictures, especially those gorgeous red leaves. I have a few trees like that outside my bedroom window and have been hoping they’d stick around for a while. The hut is adorable. One can never see too many fall pictures! It’s the best time of year. That hut is awesome! i love it, my kids would love it, great idea!!! Stopping in from PEAR. And don’t worry – there is never such a thing as too many fall pictures.